A Chicago man was charged with aggravated battery with a firearm, reckless discharge of a firearm and vehicular invasion following a shooting at a Cook County Preserve soccer field on Labor Day that injured one other man. The alleged shooter then tried to flee the scene by stealing a vehicle. A person commits the Illinois crime of aggravated discharge of a firearm if he “discharges a firearm in the direction of another person.” In this case, we would first challenge the validity of the defendant’s identification as the shooter, looking first at whether gunpowder residue was found on the defendant’s hands or clothes, or whether his fingerprints were found on the weapon. We would also challenge any eyewitness descriptions of the shooter. There were approximately 2,000 people present at the soccer game, given the chaos that ensued after the shots were fired, eyewitnesses would have difficulty accurately describing the shooter, let alone determining who fired the weapon. Another important point concerns whether the eyewitness descriptions of the shooter match the defendant. If the witness descriptions do not match, it would indicate a different person was responsible for the gun’s discharge. 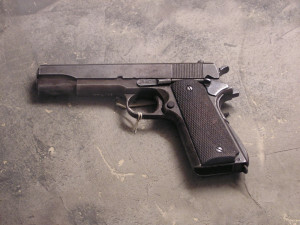 Assuming eyewitnesses could positively identify the defendant as the individual who discharged the firearm, or if gunpowder residue shows the defendant fired the gun, a successful defense would require a thorough examination of the weapon to determine whether discharge was due to a malfunction. If the weapon discharged due to malfunction, the defendant cannot be charged or convicted of reckless discharge. David L. Freidberg’s team of forensic experts would examine all of the evidence surrounding discharge of the weapon to determine whether another explanation exists for its discharging. A person commits the Illinois charge of aggravated battery based on use of a firearm if he discharges that firearm and causes injury to another person. In this case, we would employ many of the same defenses as in the aggravated discharge of a firearm: challenge the identification of the shooter, as well as any evidence indicating he was actually the shooter. Forensic experts would thoroughly examine the defendant for evidence of gunpowder residue on his hands or clothes (or review police reports on these findings) to determine if the prosecution can prove, beyond a reasonable doubt, the defendant fired the weapon. If the evidence proves the defendant did in fact fire the weapon, we would again examine whether there is another reason the weapon discharged, other than through the defendant’s intent. A charge of aggravated battery based on use of a firearm requires the defendant “knowingly” discharge the weapon. If the weapon malfunctioned, he did not knowingly discharge the weapon. If you were arrested and charged with aggravated battery with a firearm, reckless discharge, or any other weapons charge, you need an experienced Chicago weapons charges attorney. Getting a weapons charge tacked on to the underlying crime significantly increases the penalties for conviction, even if the weapon was not used during commission of the alleged crime. David L. Freidberg has successfully defended against or received a reduction in charges for all manner of weapons charges. Contact our office today at 312-560-7100 to schedule a free consultation. We are available 24/7 for your convenience.